Pokie, aka M It's Slow Poke, is a gorgeous red brindle 2½-year-old female, born December 25, 2002 - a Christmas greyhound! 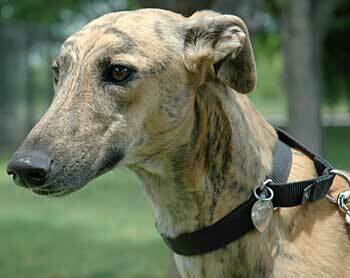 Her sire is Gable Oscar, making her grandsire Gable Dodge, and her dam is Cry Monica, making her grandsire Wigwam Wag. 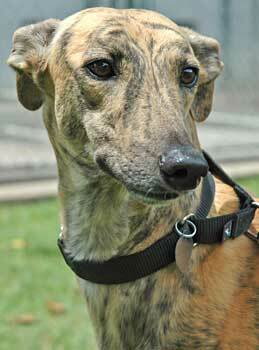 Although Pokie was a greyhound released from Valley Race Park in Harlingen, there are no races to her credit on Greyhound-data.com, so guess her name says it all - at least for the racing circuit, but she is a winner in the companion pet arena! It is not known at this time if Pokie is small animal or cat tolerant.